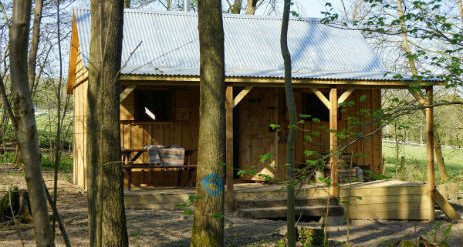 There are only 2 luxury Yurts and 4 log cabins located in their own secluded area of the woodland, each with 2 x double beds. Guests will enjoy in the calm and meditative atmosphere of the ancient woodland formerly known as ‘Anderida Forest’. 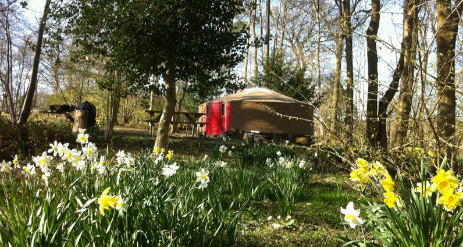 The Yurts & cabins sleep between 2 and 6 people. Each has a twin gas ring cooker, log burner, outside fire pit and BBQ and are located between 50-80m apart ensuring seclusion. 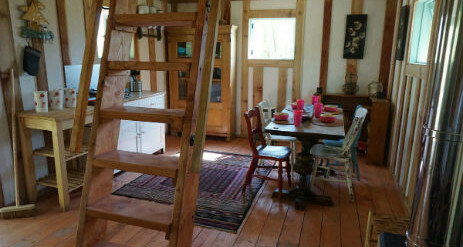 The whole site can accommodate groups up to 25 people. The centre piece is the creation of the Forest Garden, a low-maintenance and sustainable food production system based on companion-planting, which incorporates a variety of perennial fruits, nuts, shrubs and herbs grown within the seven canopy layers. (An acre of Forest Garden can sustain up to 10 people.) Much of the food grown is served to guests in Forest Garden café and shop. 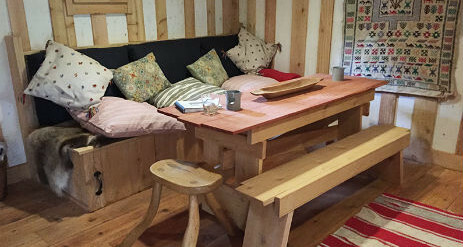 Luxury glamping accommodation in beautifully appointed traditional Yurts and rustic Log Cabins. 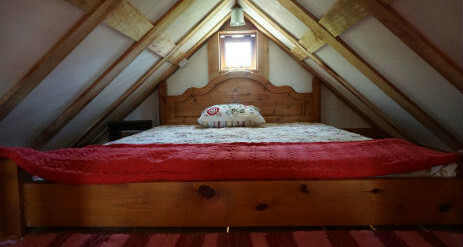 Ideal for a romantic getaway, a family holiday or a group break. Woodland craft courses, activities, therapies & treatments are also available. We are passionate about the natural environment. The site has been designed adopting the principles of Permaculture, and we demonstrate different ways of lowering our carbon footprint and living more self sufficiently. Eco-credentials include rainwater harvesting, solar power and food supplied for the café from our forest and vegetable gardens. Visitors are encouraged to compost their own green waste on site. Guests enjoy the simple pleasures of cooking over a camp fire under the stars, seeing and hearing the abundant flora and fauna, picnicking in the woods or enjoying the many spectacular walks in this Area of Outstanding Natural Beauty. The hot power showers and proper flushing loos are located beside the café, just a short stroll from each yurt & cabin (50-150m). Kushti yurt is a traditional Mongolian ‘Ger’ or Yurt with hand painted roof poles and is 5.9 metres in diameter. It is furnished with ethnic textiles and furniture with a central wood burner and it has a wonderful warm and romantic feel about it. Kushti sleeps 2 on one double futon and there is also a small futon sofa. 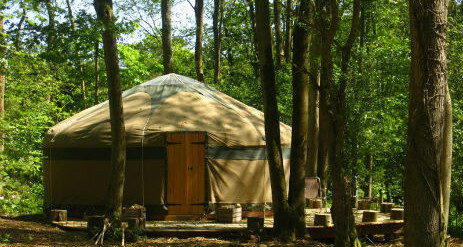 Savannah yurt is 6 metres in diameter and is made locally using coppiced ash, hazel and chestnut. It is furnished with sheepskin rugs, leopard print throws and has a distinctly ‘Out of Africa’ feel to it. A wood burning stove will keep you toasty warm at night. 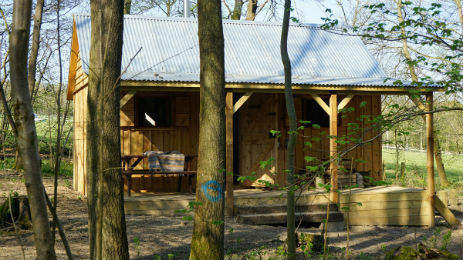 There is a large decked area outside allowing guests to enjoy the peace of the woodland. There’s a big picnic table below the deck and beside the large fire-pit. There is a BBQ and locally produced charcoal is available from the Forest Garden Shop. Savannah has an additional charge of £35 for the 5th person. Breakfast (available only on Saturday & Sunday). To be booked at least 24 hours in advance. Please contact us. Torches, wellies, slippers, fire lighters, towels, insect repellent, sun cream, extra outdoor camping lights.